CDL – Conservatoire du Littoral | LiCCo. The Cdl is interested in past and future geomorphological evolutions of the LiCCo sites’ coasts. This analysis presents an historic perspective of the landscape and the geomorphological evolution of the French LiCCo project sites. It is illustrated by visuals aids such as old maps, old postcards, photos etc. The coast is not something that is geographically fixed. It evolves through physical processes linked notably to meteorological-marine phenomena and is subjected to the impact brought about by the establishment of human activities. The objective is to understand the ancient evolution of the sites’ landscape and to provide communication information, especially for site-based workshops and exchanges with local actors. The most recent data (aerial photos and Lidar overview) is used to draft sea-level rise scenarios for the years 2025-2050. The integration of the coastline’s evolution and land occupancy using multidisciplinary expertise should allow possible practical links with other areas (avifauna, habitats, benthos, halieutic, socio-economic diagnosis) to be determined. The principal objective of linking naturalists’ expertise with social and economic expertise is to contribute to a multi-criteria and multidisciplinary reflection on the potential effects of climate change on biodiversity, habitats and our society. 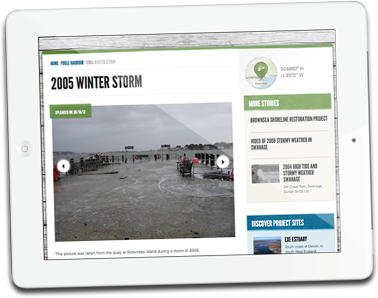 To help coastal communities to better understand, prepare for and adapt to the impacts of climate change, sea level rise and erosion on the natural and human environment. To improve our understanding of the impact of climate change on coastal plants and animals and to identify those which are most affected. To deal with the challenges and seize the opportunities arising from these changes.